The Braves, whether they’ve been in Boston, Milwaukee or Atlanta, have usually had great looking uniforms. Today I’ll share with you two new pieces of art that showcase a couple of my favorites. 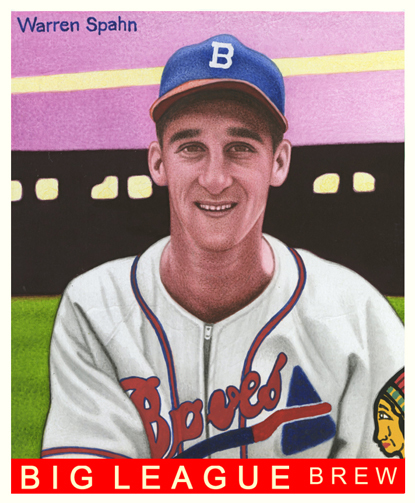 First off, we have Warren Spahn wearing the familiar “tomahawk” jersey that we all love. This style was introduced for the 1946 season, perhaps in recognition that with WWII now over, it was high time for a bit of enthusiasm and a fresh start. The sad fact that the team had not finished higher than fifth place (and usually much lower) in the previous 11 seasons would factor into the “fresh start” theory. The new uniform was ambitious in both design and execution, rivaling only the famous St. Louis Cardinal graphics. The simple blue chest script (reading “Boston” or “Braves”) was replaced by the three color, stylized “Braves” and the tomahawk graphic added. The new cap and hose redesigns added drama through color. Only the Indian head logo on the left sleeve was kept for continuity, and even that was reversed. In addition, a shimmering silk uniform version was introduced for the new-fangled night games. 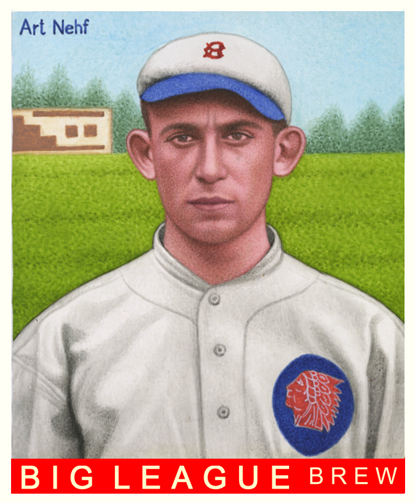 Our second painting shows hurler Art Nehf in the Brave’s home uniform used from mid 1915 through 1920. Nehf pitched for the team, usually quite well, from 1915 through part of the 1919 season. This uniform style has an early, simplified version of the Indian head prominently placed over the left breast. The red and white head, encircled by dark blue, must have been quite difficult to make out at any distance. I’m not familiar with many cards from that era showing this uniform, and none in color. As for Nehf, his career spanned 15 years, over which he accumulated a very satisfactory 184-120 record. These are great, great paintings. It is the first time I’ve seen a picture of Art Nehf. In fact, this is the first time I’ ve ever heard of him, although I know about a lot of players from his era. The picture of Spahn looks like it was taken with a camera. It looks exactly like him. An interesting fact is that when Spahn came up with the Boston Braves in 1942 at age 21, Casey Stengel was his first big-league manager. The Braves fired Casey in 1943. And Spahn did not play again for Casey until 23 years later when he played for him as a member of the hapless New York Mets. In 1942, Casey and Warren did not get along after Warren refused to throw at Pee Wee Reese of the Dodgers. Casey told Warren he had no guts. But Warren became a hero in World War 2. He participated in the of the Battle of the Bulge. After he finished the 1942 season in the minors, he had enlisted in the Army.. While in the Army, he was awarded a purple Heart and the Bronze Star for bravery. And of course, Warren pitched against Casey and the Yankees in the 1957 and 1958 World Series. But when the Braves beat the Yankees in the 1957 series, Lou Burdette, who pitched for the Yankees as a September call up in 1950 and then traded to the Braves for former four-time 20 game winner Johnny Sain, in 1951, was the MVP of the series after having three complete game victories of the Braves 4 wins in beating the Yankees. A couple more interesting tidbits are in 1951, Giant rookie Willie Mays , after beginning his career 0 for 12, hit his first major league home run off Spahn. And in 1962, Spahn gave up a home run to Sandy Koufax, the first of his career. Sandy only hit one other. I vividly remember the first one. In 1962, after I graduated from Central Valley high school in Spokane, Washington, my parents took me and my younger brother and younger sister on a trip to California. After we arrived at my uncle’s house in Millbrae, which is only about 5 miles from Candlestick Park, that evening I went to the store with one of my cousins. I remember the store owner having the Giants game on the radio and heard Russ Hodges, the Giants announcer, in giving the scores of other games, mention that Koufax hit a home run against the Braves. Russ Hodges will forever be remembered as the New York Giant’s announcer in 1951, when Bobby Thompson hit the three run home run off the Dodger’s Ralph Branca in the last of the 9th inning of game three of the playoffs, excitedly yelling, “Bobby Thompson hits into the left field stands, the Giants win the pennant, Giants win the pennant, Giants win the pennant, oh, they are going crazy.” In 1951, I was only 7 years old and not yet a baseball fan. But as a Dodger fan for 53 years, that home run still stings today. I have read so much about it over the years and heard the Hodge’s famous call on tape countless times. Before Thompson hit the home run, Hodges said, Hartung down the line from third, Branca pitches and there is long drive to left field, it is going be I believe, and then he says, “Bobby Thompson hits into the left field stands. . . .” The runner on third base was Clint Hartung, a young player who was literally touted as the next Babe Ruth because he could both hit and pitch. But he never did much in the majors. Oh, the memories!